Fergus Torrance of Titan, Hyde & Torrance writes in to tell me about a new opportunity for a refit project, Picchiotti's 38.7m superyacht Tamarindo. Built by the Italian yard in 1987, the superyacht's now offered with her entire interior stripped bare, giving the potential buyer a blank canvas to indulge his own tastes and needs, with her previous incarnation accommodating 10 guests in five staterooms. 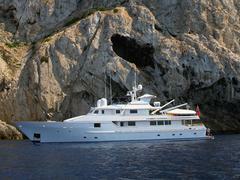 MCA compliant after a major refit at Pendennis in 2006, Tamarindo_ _is asking €1.695 million, VAT paid.